An artist’s impression of The Mansions @ ParkCity Heights. The success of Desa ParkCity is certainly a case of opportunity coming to the one who is best prepared and on the lookout for it. When the 473 acres of ex-quarry land in the vicinity of Bandar Menjalara, Kuala Lumpur was up for sale about a decade ago, there were no takers as it was deemed too rocky for development. At around that time, Miri-based Samling Group was looking to venture into property development in Peninsular Malaysia and when the land was offered to the group, it did not hesitate to sign up. Going by what had been achieved in the past nine years since the tractors started to roll in, the developer had certainly done an enviable job with the land. What was once a rocky and hilly terrain had been turned into a thriving township and a highly sought-after address, Desa ParkCity, by Samling's property development arm Perdana ParkCity Sdn Bhd. Perdana ParkCity group chief executive officer Lee Liam Chye, a property valuer, could see the immense hidden value of this seemingly unattractive land. “Its rocky nature with a large reserve of granite rocks would incur much work and capital outlay to get it ready for development. Despite this, we could see the tremendous value in the land and envisioned a planned community township for it,” Lee reveals to StarBizWeek. So far, some RM300mil had been spent and according to Lee, the result shows that all the hard work and every sen expended has been worth it. The development has proven to be a huge gold mine to the developer. Since the project took off in 2002, 13 phases comprising 2,061 houses have been built and 485 units are under construction. Of this, 2,498 units have been sold and the total gross development value (GDV) for these phases is estimated at RM2.5bil. It will take eight more years for the whole development to be completed. By then, the township would have 7,000 mixed residential units comprising park homes, courtyard terraces, semi-detached houses, bungalows and condominiums for a population of 35,000. Next year, the company will be unveiling a 43-acre town centre with 3 million sq ft of net commercial space and 1,000 condominiums. The project will take six years. By the time it is completed, Desa ParkCity will command a total GDV of RM8bil. Desa ParkCity is today home to one of the most expensive residential properties in the Klang Valley and possibly the country. Its property has registered compounded capital appreciation of between 50% to 150% since 2002 or about 10% to 25% a year. 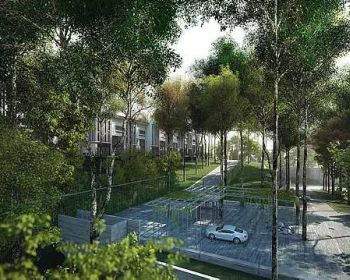 In its latest launch of the 147 Casaman terrace houses the 13th phase of Desa ParkCity it once again set new price benchmark. The intermediate terrace units of 3,100 sq ft fetched RM1.75mil or RM563 per sq ft, while corner units with land area of 3,800 sq ft and built-up of 3,300 sq ft exchanged hands for RM3.3mil. They were sold out within four hours. The buyers were among the 800 hopefuls who turned up last June 26 for a balloting for the limited units. The huge price appreciation in Desa ParkCity's property has resulted in remarks that a property bubble is dawning in the Klang Valley. Lee is miffed by such remarks but remains optimistic that the premium price at Desa ParkCity will be sustainable. “Of late, there has been much chatter about Desa ParkCity's property prices. People seem to think they have escalated too rapidly, particularly over the last four years and have reached a level that is unsustainable. “I believe Desa ParkCity's house prices are sustainable. Aside from the recent addition of the private hospital and international school, we will begin to construct the RM1.5bil town centre next year and expect the project will have ripple effects on the property value in the township,” he adds. Lee says there is no substitute for Desa ParkCity and buyers are willing to pay for the good location, holistic community concept, safe and secure environment, good facilities and landscaping, and easy accessibility. “Our homes are grouped into 23 distinctive residential neighbourhoods that foster a sense of identity and belonging. Each neighbourhood has its own distinctive identity through the architecture and landscaping elements. He says there is everything at the doorstep waterfront food and beverage outlets dishing out a variety of cuisines, supermarket, hospital, schools, colleges, clubhouse and sports centre. In his words, Lee is “saving the best for last” and on May 14, the Mansions @ ParkCity Heights will be unveiled. It comprises 127 regal parkhomes of 2, 3 and 3 storeys with built-up of 4,376 sq ft to 7,218 sq ft. The residences will be priced from RM2.7mil to RM4.6mil, or at RM650 per sq ft. The 2-storey type has 31-foot wide frontage. The frontage for the 3 and 3 storey units is 33 ft and they will also be fitted with individual lifts. The huge success of Desa ParkCity has spurred the group to look for other development opportunities. It made a foray into Vietnam last year. In a 60:40 joint venture between Perdana ParkCity Pte Ltd and VinaconexHoang Thanh JSC, ParkCity Hanoi is a 77ha self-contained township and master-planned community featuring 7,500 housing units, a neighbourhood mall, international school and clubhouse. The RM7bil project will take 10 years. Locally, Lee also does not discount the possibility of replicating its success in other parts of the country. “The land we are looking for has to be at least 300 acres and in an upper middle class neighbourhood. We may also consider a joint venture with the land owner if the right parcel comes along,” he says.